Definition: Commodore Matthew Perry's Mission to Japan consisted of two expeditions, the first expedition was in 1853 and the second in 1854. Commodore Matthew Perry negotiated the Kanagawa Treaty (Treaty of Amity and Commerce) opening diplomatic and trade relations between the United States and Japan. Matthew Perry made use of the new steam powered gunships. Matthew Perry also used the new cannons, the Paixhans shell gun, to emphasize the military force of America, which became known as "Gunboat Diplomacy". Millard Fillmore was the 13th American President who served in office from July 9, 1850 to March 4, 1853. One of the important events during his presidency was Commodore Matthew Perry's Mission to Japan. Commodore Matthew Calbraith Perry (1794-1858) was the younger brother of Captain Oliver Hazard Perry (1785 – 1819) who had fought so bravely during the Battle of Lake Erie during the War of 1812. Matthew Perry was born in South Kingstown, Rhode Island on April 10, 1794 and followed in his brother's footsteps by following a naval career first as a young midshipman, then as a Lieutenant and then in 1837 was promoted to the rank of Captain and became involved in the development of steam ships. Matthew Perry: "Father of the Steam Navy"
Matthew Perry was a great innovator and pioneered the application of steam power to warships. In 1837 Matthew Perry was given the command of the Fulton, which was the first steam vessel in the United States navy. Commodore Matthew Perry became known as the "Father of the Steam Navy" because of his commitment to introducing steamships, powered by a steam engine, to the US Navy. The first side-wheel steamships were about 230 ft long and had two coal-burning side-lever steam engines that turned two paddle wheels that were 28 feet in diameter. The new Steamboats had a crew of 260 men and carried a new type of canon called Paixhans shell guns effectively making the steamships powerful gunboats. In 1842 Matthew Perry was promoted to the rank of Commodore and his early missions included command of the African Squadron, a unit of the United States Navy that operated to suppress the slave trade along the coast of West Africa. 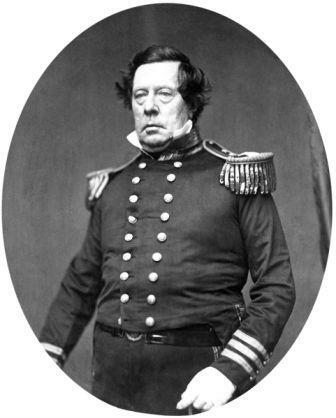 In March 1852, President Millard Fillmore ordered Commodore Matthew C. Perry to command the U.S. Navy's East India Squadron and to establish diplomatic and trading relations with Japan. Japan had historically operated under a policy of isolationism (called Sakoku meaning "locked country") which prohibited contact with most outside countries. The exceptions to this were with China, Korea and the Netherlands. The United States had wanted to establish diplomatic and commercial relations with Japan for many years. In 1846, Commander James Biddle commanded two ships, including one warship armed with 72 cannons. The requests of James Biddle for a trade agreement were unsuccessful. In 1849 another United States expedition commanded by Captain James Glynn received a more favorable response and recommended to the United States Congress that negotiations to open Japan should be backed by a demonstration of military force to 'persuade' Japan to open trade with America. thus paving the way for Matthew Perry's 1853 expedition to Japan. Commodore Matthew Perry's 1853 expedition to Japan was initiated by President Fillmore in March 1852. Commodore Matthew Perry was given orders to break this policy of isolationism (Sakoku) by diplomatic means. However, the new steamships were effectively gunboats providing Matthew Perry with a superior military force, using the latest steam engine technology that was unknown to the Japanese. 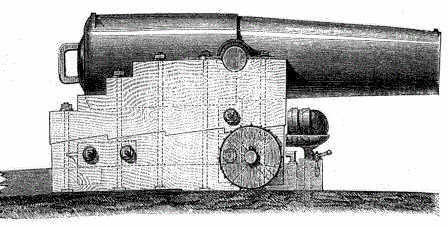 Commodore Matthew Perry's steam engine gunships, called the "Black Ships", were also equipped with the new Paixhans shell guns. Commodore Matthew Perry's cannon were Paixhans shell guns, the first naval gun designed to fire explosive shells. The barrel of the Paixhans shell gun weighed about 10,000 lbs. (4.5 metric tons), and proved accurate to about 2 miles. The Paixhans shell guns were capable of wreaking havoc and great destruction with every shell. The United States Navy equipped several ships with 8-inch and 10-inch Paixhans shell guns including those in the fleet of Commodore Matthew Perry. Paixhans shell guns were used on the USS Mississippi (10 Paixhans guns), and USS Susquehanna (6 Paixhans guns) during Commodore Perry's mission to open Japan in 1853. Commodore Matthew Perry's Black Ships: "Giant dragons puffing smoke"
The "Black Ships" was the name given to all Western vessels trading with Japan. The first "Black Ships" arrived in Japan in 1543, owned by the Portuguese. Portugal initiated the first contacts with Japan, establishing a lucrative trade route linking Goa to Nagasaki until they were expelled in 1639. The large Portuguese carracks had the hull of their ships painted black with pitch, and the term came to represent all vessels used by western foreigners. The term "Black Ships" therefore at first referred to the black color of the hull of older sailing vessels. The same term was applied to Commodore Matthew Perry's vessels. Matthew Perry's "Black Ships" were also painted with black hulls but they also had black smoke from the coal-fired power of the American ships. The Japanese had never seen a steam powered ship, likening Matthew Perry's "Black Ships" as "Giant dragons puffing smoke", the Paixhans would have demonstrated that the "dragons" also had the power to breath fire. The term "Black Ships" would later be used in Japan to symbolize a threat imposed by Western technology. Commodore Matthew Perry's mission to Japan coincided with a weak Japanese government. The Japanese ruler, Emperor Komei only possessed symbolic power at his court in Kyoto. The real power in the government of Japan was held by the Tokugawa Shogunate, a political form of dictatorship by the Japanese feudal lords whose power was based in their military force. The head of the Shogunate was Tokugawa Iesada who was the 13th hereditary Shogun. The Shogun was the real ruler of Japan, supported by Samurai warriors. The Shogun at the time of Matthew Perry's Mission to Japan was Tokugawa Ieyoshi, but the 60-year-old shogun died soon after Matthew Perry's fleet arrived and his son Tokugawa Iesada assumed the position of Shogun in 1853. The new Shogun, Tokugawa Iesada, was physically weak lacking neither experience nor strong qualities of leadership. Commodore Matthew Perry arrived in Japan in 1853 to open diplomatic and commercial relations between Japan and the United States. The 1853 expedition consisted of in command of the East India Squadron consisting of four frigates (all with black hulls), the Mississippi, Plymouth, Saratoga, and Susquehanna. Matthew Perry had researched the culture of the Japanese and knew of the political and military instability of Japan due to the new Shogun. Matthew Perry was met by representatives of the Tokugawa Shogunate who told him to proceed to Nagasaki, the only Japanese port open to foreigners. Matthew Perry made a forceful impact on the Japanese by refusing to enter the foreigners' port of Nagasaki by proceeding directly to Uraga, near the Shogun's capital of Edo (Tokyo) bay. Matthew Perry Entering Edo Bay on July 2, 1853 with 967 men on his four war ships with sixty-one guns. Commodore Matthew Perry demanded that Japan open its ports to trade with the United States. His war ships were larger than any the Japanese had seen, and their dark hulls and black smoke emphasized the name of the "Black Ships." He then ordered some buildings in the harbor of Uraga to be shelled by the Paixhans, intimidating the Japanese and demonstrating the military power of the United States. 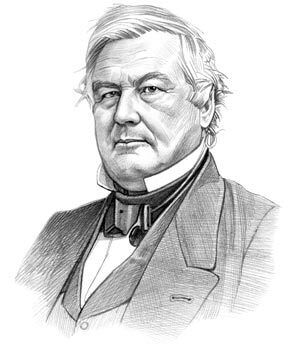 Matthew Perry demanded negotiations on his own terms and declared that he would return the following year to receive the Japanese response to the letter from the President Millard Fillmore, to the Emperor of Japan. Matthew Perry left Japan on the July 14, 1853. 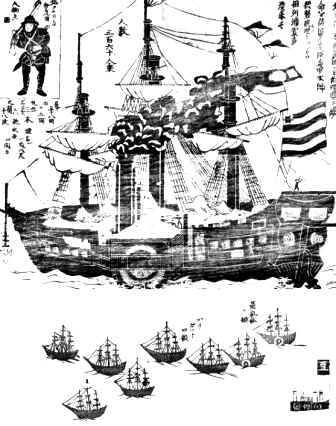 The picture on your right depicts excerpts from an 1854 Japanese print relating Matthew Perry's visit featuring the Powhatan flag ship and the other ships that formed the Japanese expedition fleet. The American ships were manned by a total of 1600 men. Matthew Perry arrived in Japan on February 13, 1854 and was met with Japanese officials at the Convention of Kanagawa to discover that the Japanese had conceded to nearly all the terms in President Fillmore's letter. The Treaty of Kanagawa between the United States and Japan was signed on March 31, 1854. The article on the Commodore Matthew Perry's Mission to Japan provides an overview of one of the Important issues of his presidential term in office. The following Millard Fillmore video will give you additional important facts and dates about the political events experienced by the 13th American President whose presidency spanned from July 9, 1850 to March 4, 1853.